A more or less annual tradition is an excellent adventure with friend of the Wanderlust, Bruce Rabe. However, what with the shoulder surgery, I had pretty much written it off this year. But the shoulder got to be feeling much better, and Bruce mentioned that there was going to be a grazing occultation of Aldebaran by the Moon on the night of October 18th. The graze line would run almost squarely through the little town of Fairplay, Colorado. This is not far from home, and there is interesting geology in the area. We began planning another excellent adventure. Let me explain about the occultation. Aldebaran is a bright star that serves as the eye of Taurus, the Bull, the constellation in which it is located. It is also close enough to the ecliptic, the plane in which the Earth orbits around the Sun, that the Moon occasionally passes in front of Aldebaran. This is called an occultation. A grazing occultation is one in which the star appears to graze the edge of the Moon, as seen from the right locations on Earth. If you are exactly on the graze path — which is only a few hundred yards wide — you can expect to see the star blink in and out as mountains on the edge of the Moon pass in front of it. This sounds way cool and having the graze path be within a day’s drive of home was just too tempting. So I okayed the idea with Cindy, reserved three nights at one of the hotels in Fairplay, and began digging up geologic road logs for the area. It turns out there were some major caldera eruptions to the southwest 35 million years ago or so; the calderas are now eroded down to where you can see the deep structures. 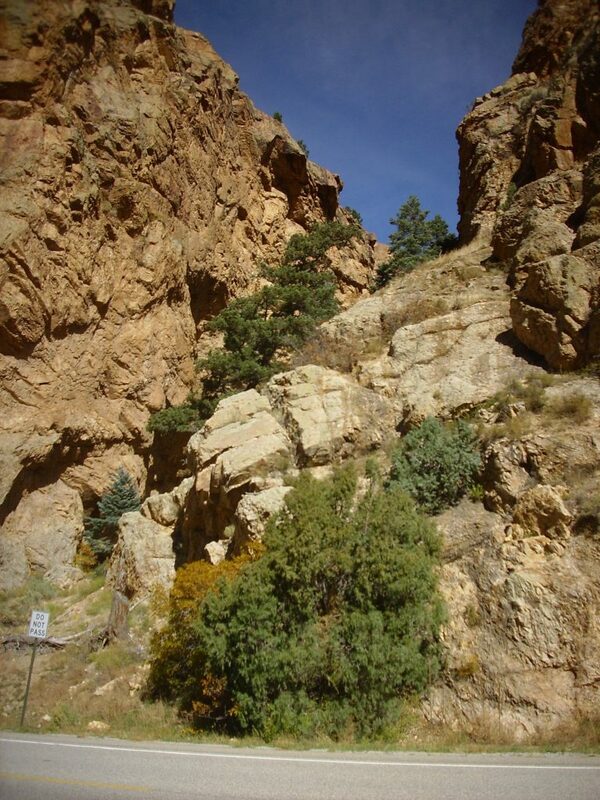 Also, it is not a huge diversion to visit the Latir caldera at Questa, New Mexico, on the way up to Fairplay. All this went into the plans. By the Friday before the occultation, I was beginning to get a bit worried. Weather radar showed a storm coming ashore in the Pacific Northwest. The long-range forecast for Fairplay called for possible snow showers the night of the occultation. This forecast firmed up on Saturday, and by Sunday I was suggesting to Bruce that we consider relocating to Monticello, Utah, where weather conditions were forecast to be just about perfect. Bruce was reluctant: It turned out he had nonrefundable hotel reservations. Well, so did I, when I looked into it. I was booked at the same hotel. We decided we would take our chances on the weather in Fairplay. But it was a good thing we had the conversation. For some reason, I had got it in my head that I would be driving up Tuesday and staying at the hotel Tuesday and Wednesday nights. Bruce sent an email Sunday night warning me he was having some mechanical difficulties with his car, would be late getting off in the morning, and would therefore probably not be able to meet me at Questa. I did not see the message until Monday morning, as I was getting ready (I thought) to go in to work. I did a bit of a double take, checked my itinerary, and realized I was supposed to be on my way to Taos. I scrambled to get ready (fortunately, not difficult, as I travel light), sent an email to my office clarifying that I would not be coming in that day, and headed out. The first part of my trip, from White Rock to Espanola, is old familiar ground. However, once I was on State Road 68, I was on less familiar ground. The lighting was perfect for a panorama of the northeast Jemez. 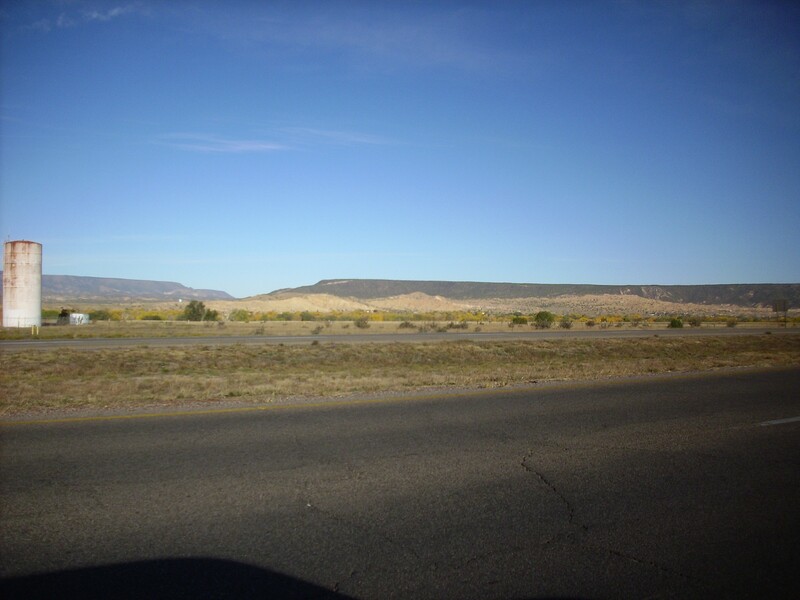 The skyline on the first frame is the edge of the Pajarito Plateau, underlain by Puye Formation and Santa Fe Group rift fill sediments. 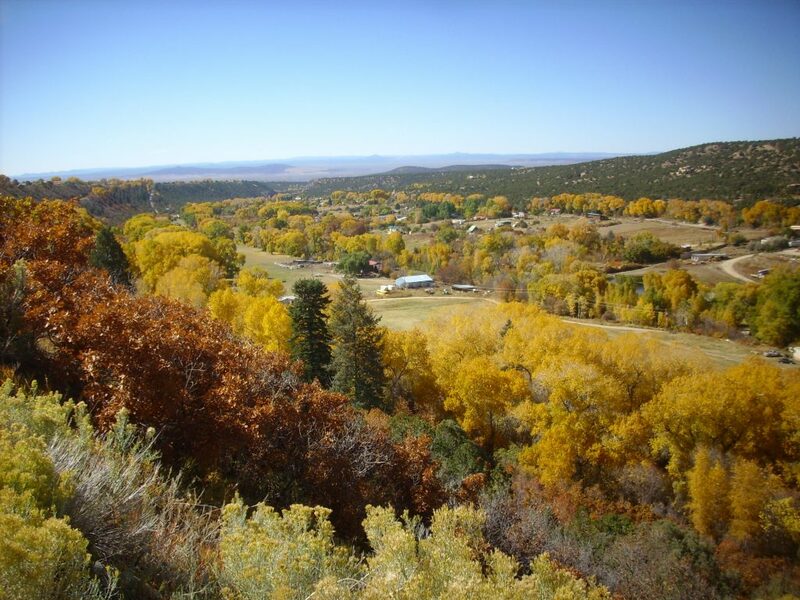 The second frame takes in the Jemez Mountains, with the highest peak in the Jemez, Tschicoma Mountain, near the center of the frame. Polvadera Peak, the third highest mountain in the Jemez, is to its right near the right edge of the frame, with Cerro Roman in the nearer distance between then. Lobato Mesa dominates the last frame. Tschicoma Mountain and Polvadera Peak, as well as the high terrain around them and to their south, are underlain by the Tschicoma Formation. This is mostly dacite, a kind of volcanic rock with a moderately high silica content, and it was erupted between 7 million and 3 million years ago. Cerro Roman and Lobato Mesa are underlain by the Lobato Mesa Formation, which is mostly basalt, a volcanic rock with a much lower silica content. They are also somewhat older, having been erupted between 10 and 8 million years ago. A little further along the road, I stopped again, for a photograph of the Chamita Formation near its type section. The Chamita Formation is one of the Santa Fe Group rift fill formations. 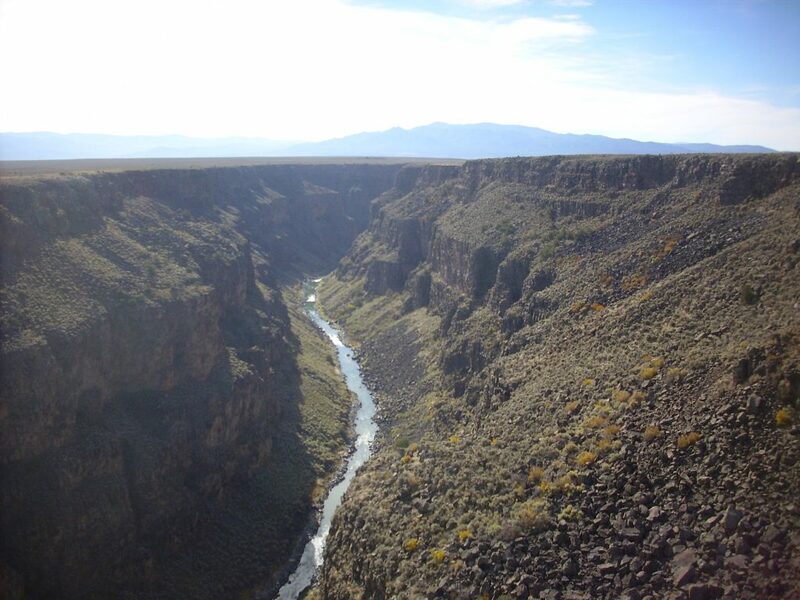 It’s sediments that accumulated in the Rio Grande Rift, the great crack in the Earth’s crust extending from central Colorado to El Paso along which the Rio Grande runs. 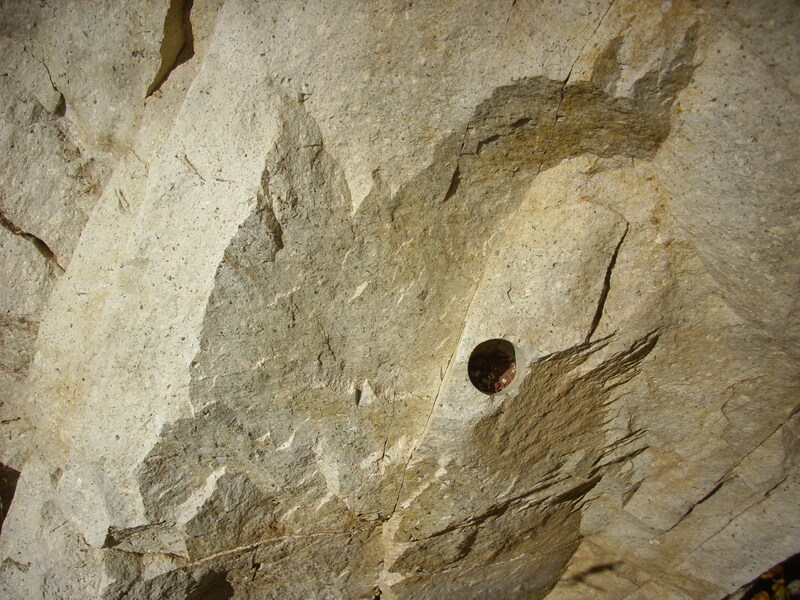 Fossils in the sediments give it an age of 5 to 10 million years or so. 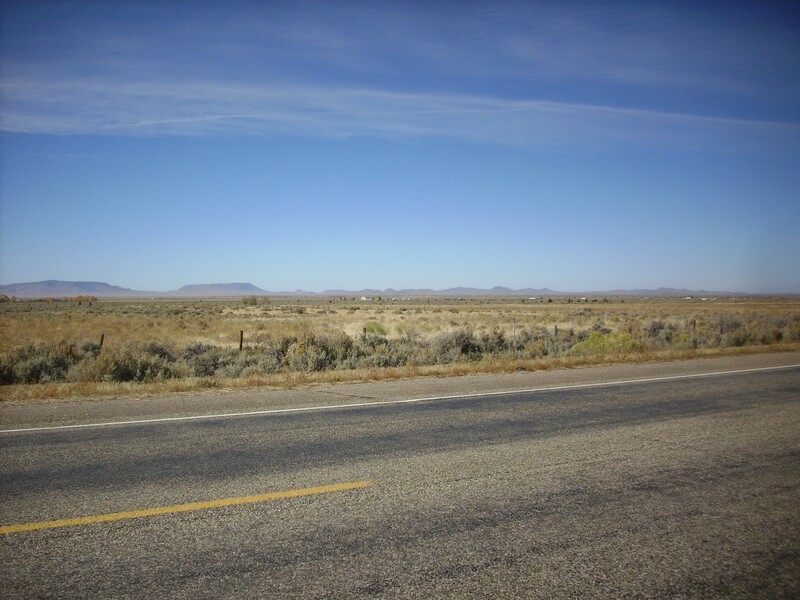 On the skyline at left is Lobato Mesa, and, on the skyline at right and somewhat closer, is Black Mesa. Black Mesa is capped with Servilleta Basalt of the Taos Plateau, erupted about 4 million years ago, and a major fault zone runs across the visible face of the mesa. 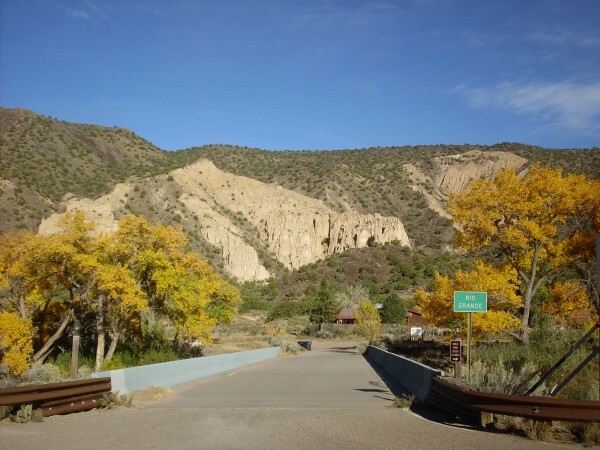 Further north, along the Rio Grande between Black Mesa and the Picuris Mountains, is an exposure of the Ojo Caliente Member, Tesuque Formation. 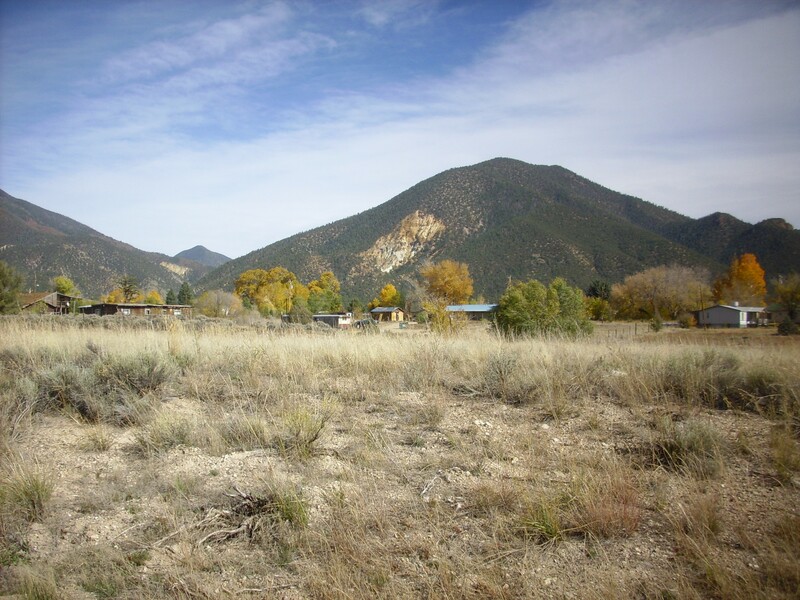 The Tesuque Formation is the major Santa Fe Group formation of the area between Santa Fe and the Taos Plateau. The Ojo Caliente Member stands out because it is a relatively well-sorted but muddy and very poorly cemented sandstone. The poor cementation causes it to easily weather into badlands like those int he photograph. On the far western skyline, in the first few frames, is the Tusas Mountains, an old Precambrian-cored Laramide uplift. 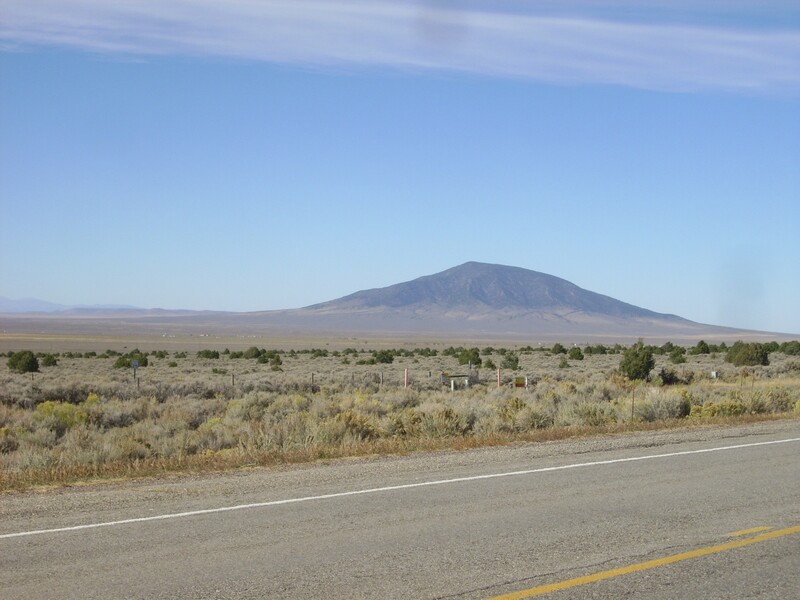 The second and third frames show small cones and domes of the Taos Plateau, all erupted in the last five million years. 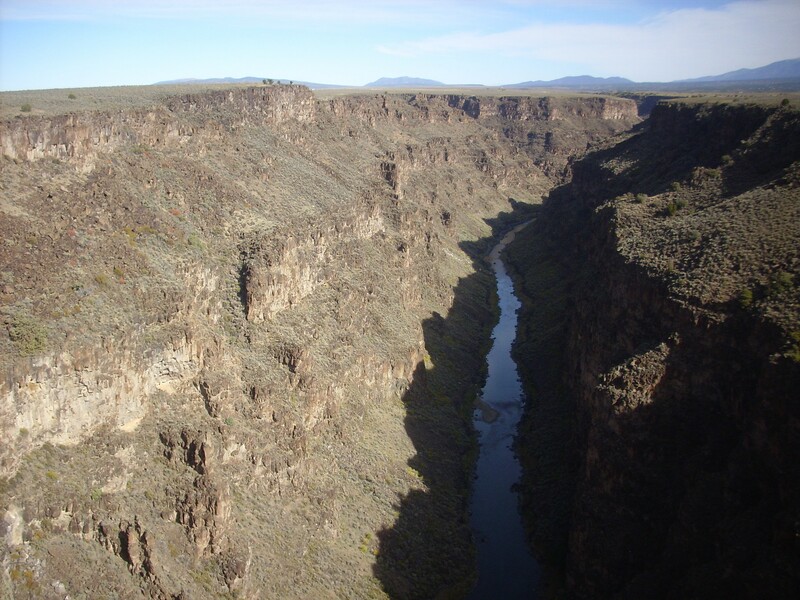 We are looking down the Rio Grande Gorge at the center of the panorama. 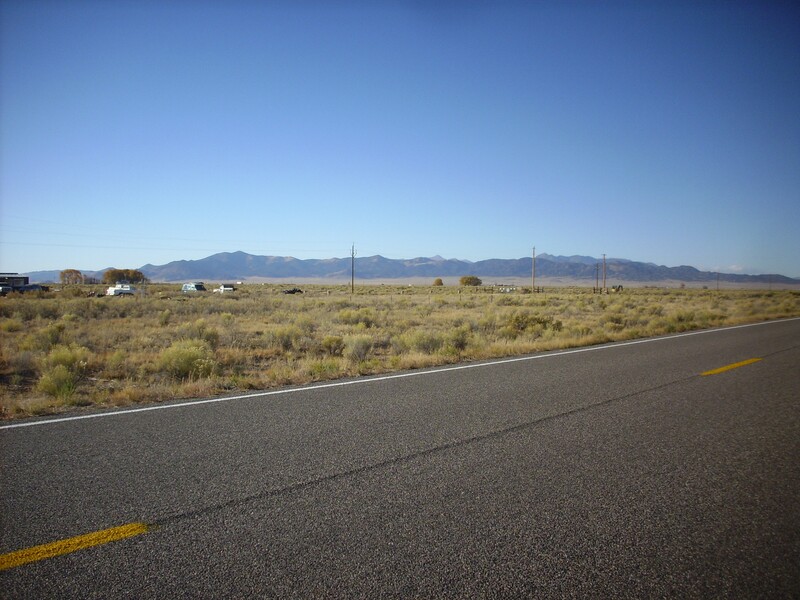 To the right are the Sangre de Cristo Mountains north of Taos. The south end is Pueblo Peak, and mostly hidden behind it is the massif of Wheeler Peak, the highest point in New Mexico. I proceeded on through Taos, making a small diversion to the Rio Grande Gorge Bridge, which is not to be missed. 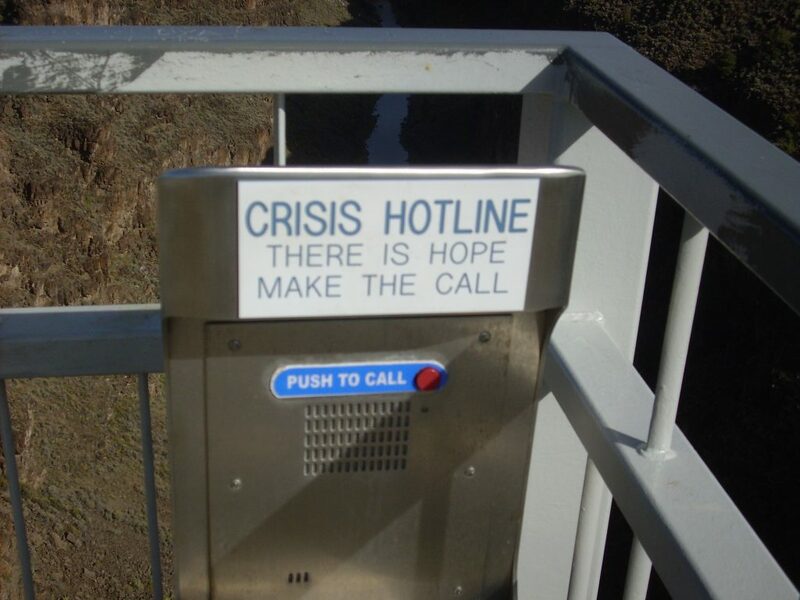 And which, sadly, has become a symbol of despair. For my part, I felt very little temptation to lean over the rail, let alone jump. Heights don’t normally bother me, but on these platforms sticking out over a void, without even any wall to one side, and with a stiff wind blowing — I was bothered. But not too much to take pictures. I took a moment to call Cindy: I had had a horrifying thought that this might be my week to check safes at the end of the workday where I work, and I hadn’t gotten anyone to swap weeks with me. I asked her to send an email to my group looking for someone to swap with me if that was the case. And, to wrap up this little thread of my story, when I got back, I found that my next week to check safes is in November. Which is a good thing, because both her emails were filtered by the spam filters at my workplace and no one ever saw them. I proceeded on north to Questa. This is the view up Red River Canyon towards the Molycorp molybdenum mine. Molybdenum is a transition metal with a number of uses in the chemical and metallurgical industries; among other things, molybdenum is an ingredient of weldable steel. The ore is found at the margins of plutons, large bodies of granite or granite-like rock formed from underground magma chambers, where these plutons come into contact with precaldera andesite. The north side of the canyon is underlain by Amalia Tuff, formed from volcanic ash erupted during the formation of the Questa caldera 25 million years ago. The beds here are intracaldera tuff, deposited in great thicknesses within the caldera itself, and is part of a resurgent dome, formed when the floor of the caldera was pushed back up by fresh magma injected into the collapsed magma chamber. 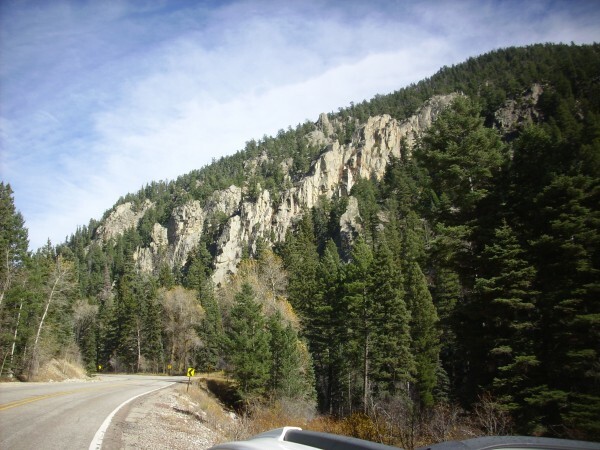 The south side of the canyon is underlain by the Bear Canyon pluton, a mass of granite and quartz monzonite crystallized from magma injected into the south caldera boundary. The boundary itself lies just to the right of the edge of the photograph. The hill in the middle of the canyon is Goat Hill, underlain by Amalia Tuff, porphyritic rhyolite, and precaldera andesite. 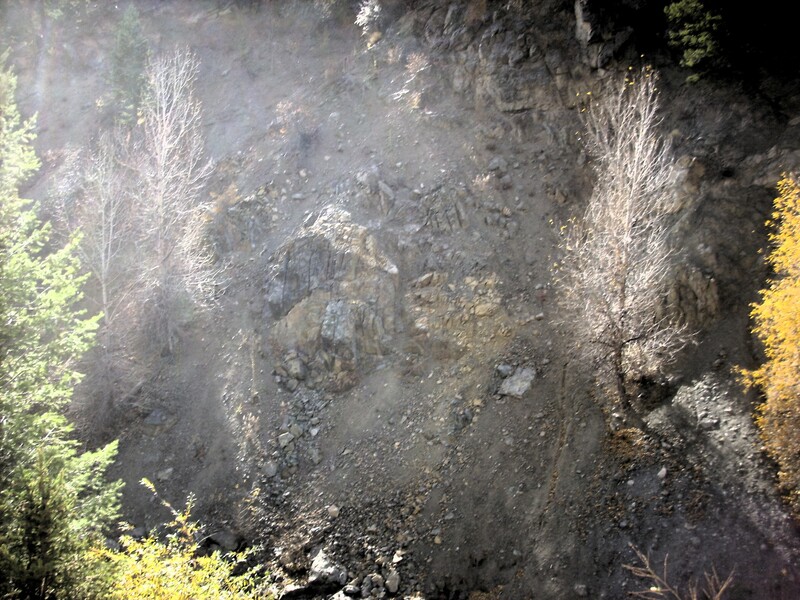 Just beyond is the Sulphur Gulch pluton, a mass of quartz latite and granite where much of the molybdenum is mined. Granite: This is a rock formed of coarse crystals of alkali feldspars and quartz with smaller amounts of plagioclase feldspar and iron minerals. 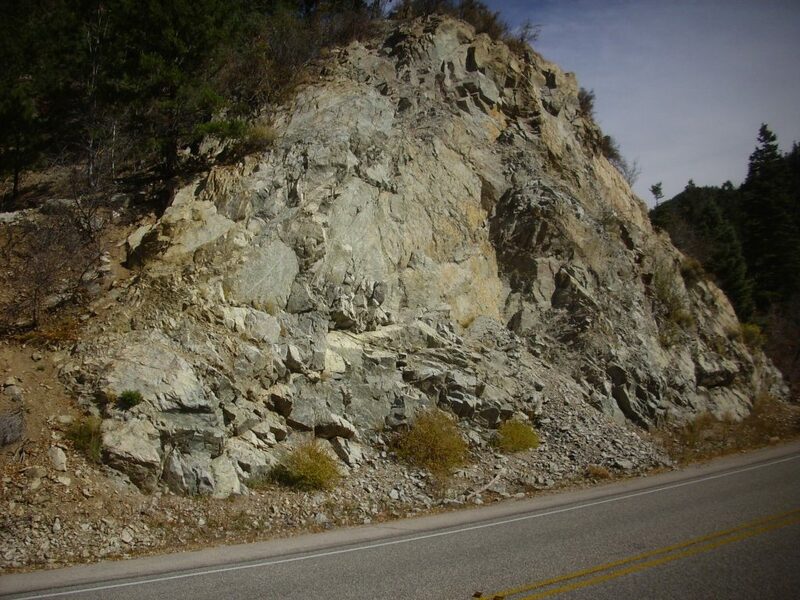 It grades into quartz monzonite as the amount of plagioclase increases, and quartz monzonite grades into quartz latite as the grain size becomes much finer. 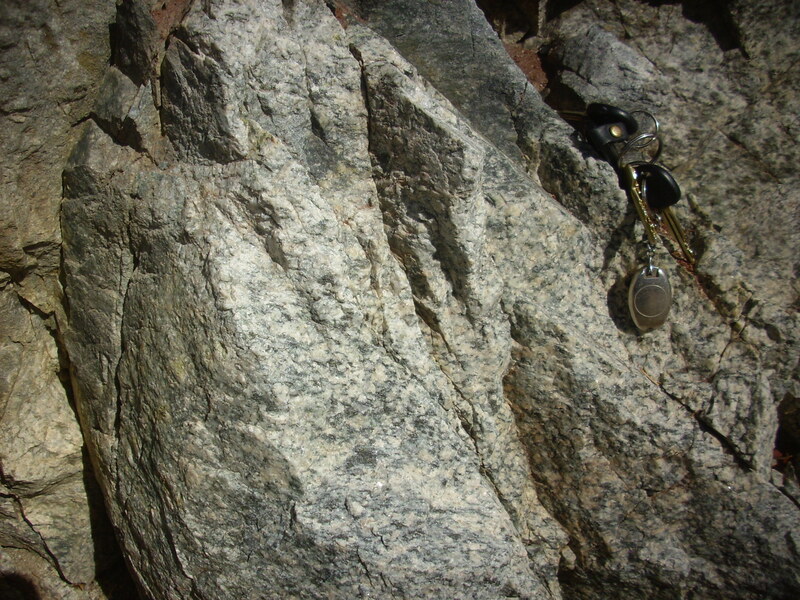 Granite likewise grades into rhyolite as its grain size becomes very fine. All are rocks typical of the kind of magma involved in caldera eruptions. 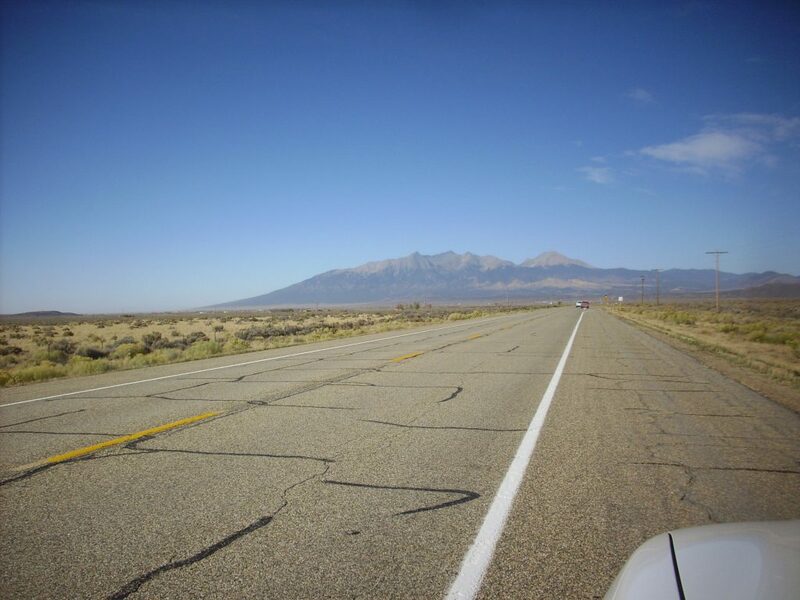 I had a New Mexico Bureau of Mines and Mineral Resources road log. New Mexico is blessed with many such organizations publishing many excellent maps and road logs. 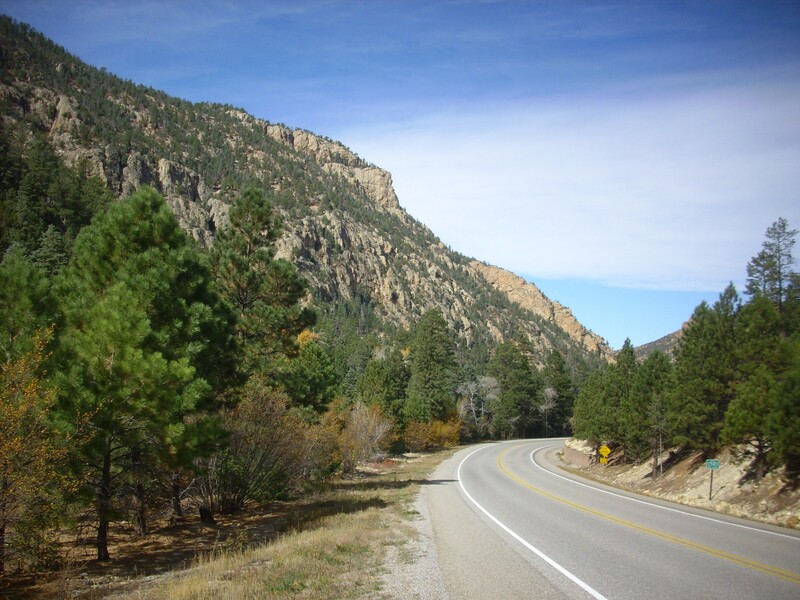 A road log describes a route to travel and gives mileage along the route to particularly interesting geological features. Bruce introduced me to the things, corrupter of innocent souls that he is, and I’ve been hooked, badly, ever since. This log led me up the canyon and to a particularly fine exposure of Bear Canyon Pluton granite just east of Eagle Rock Campground. A fine pink granite. The pink is potassium feldspar, while the white grains are quartz and the black specks are likely hornblende or biotite, dark iron minerals. Some of you may be wondering why I keep dropping my car keys near rocks I’m about to photograph. It’s deliberate, of course; the keys provide scale. We’ll come back to this point later on. A little further up the road, and a nice view back down the canyon. 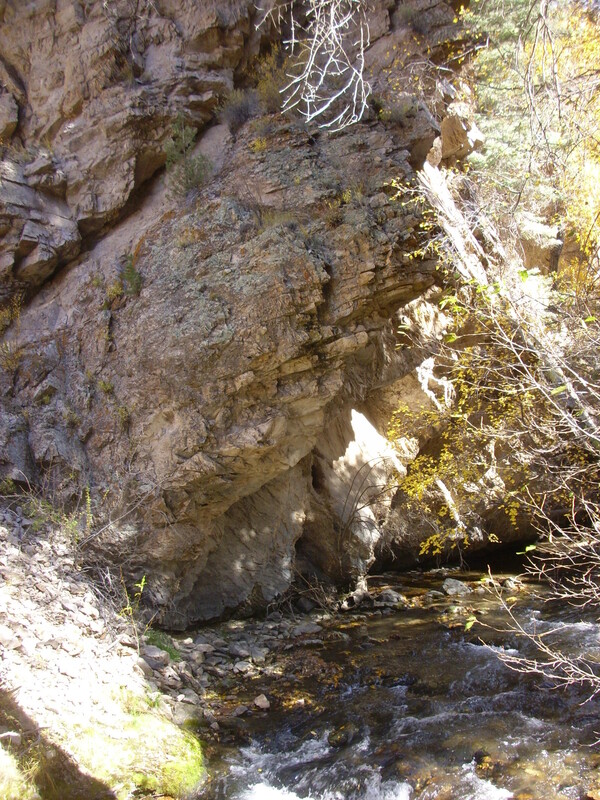 On the south side of the canyon at this location — which was, regrettably, looking into the sun — there is an outcrop of hydrothermally altered precaldera andesite. We are just north of the caldera ring fracture here, with the resurgent dome to our north and Proterozoic quartz monzonite, 1.73 billion years old, further south. I proceeded to near Columbine Campground, to examine the rhyolite dikes north of the road, and parked. Nearby was more Bear Canyon Pluton granite, though I didn’t recognize it at first; comparison of photographs shows it’s the same rock. 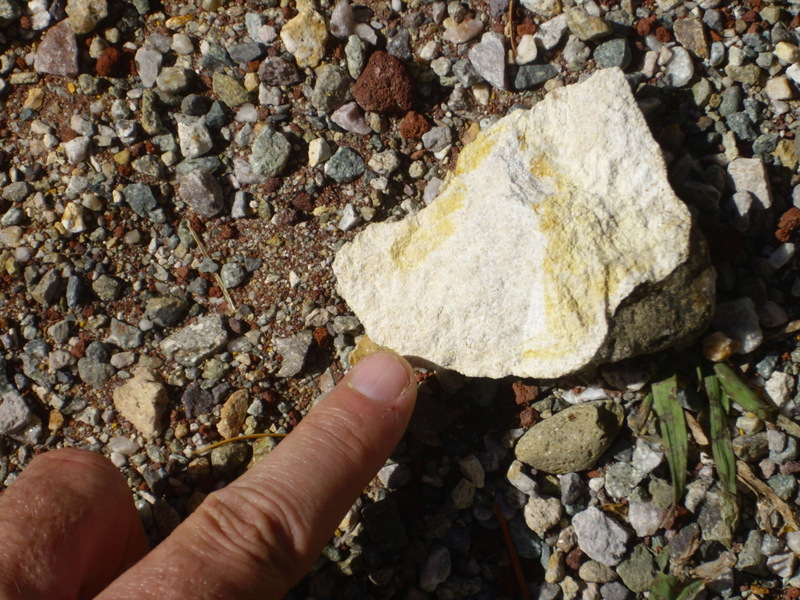 I walked further down the road to an outcrop of Proterozoic quartz monzonite. 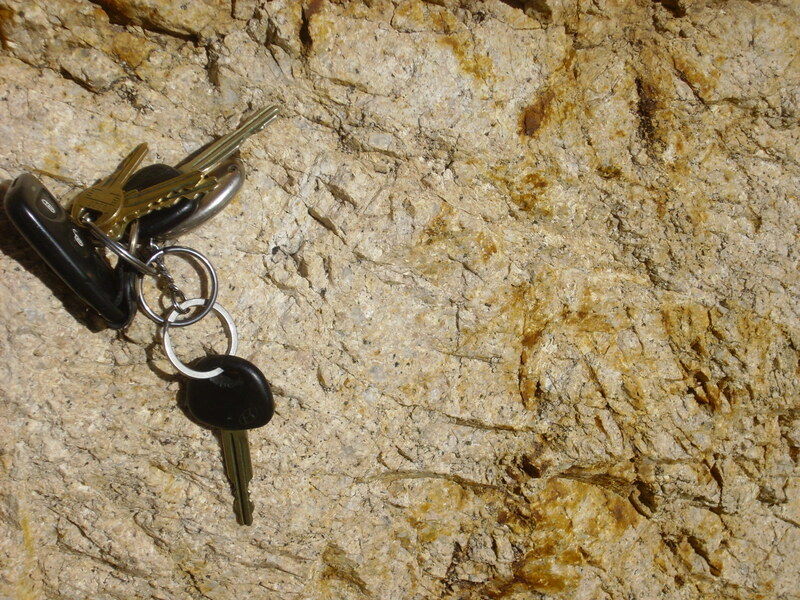 It is common for quartz monzonites to contain more dark iron minerals than granites. 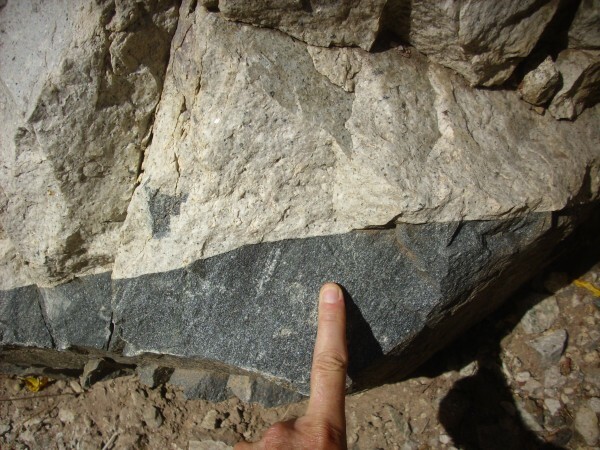 The dark minerals are somewhat aligned or foliated, a sign that this rock has undergone some metamorphosis — a very common thing in rocks as old as this one. 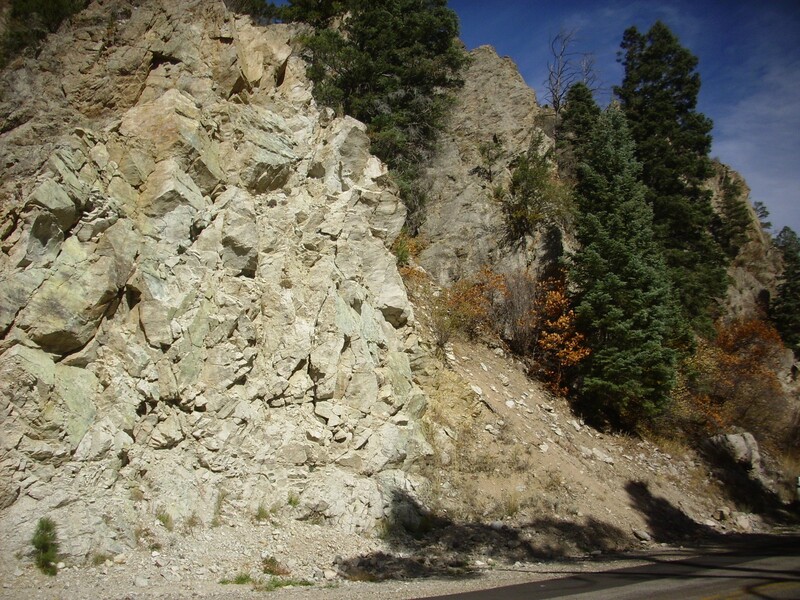 Above the monzonite, and cutting through it, is a rhyolite dike swarm. 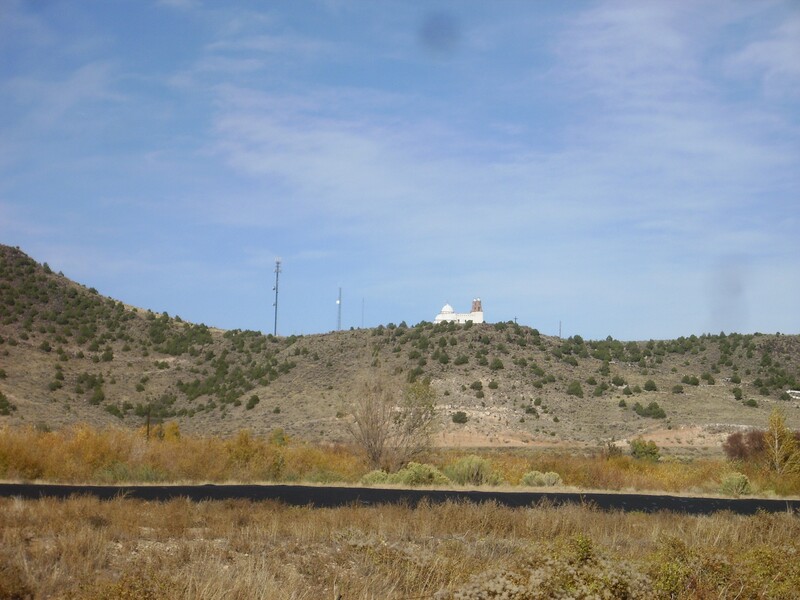 These mark the ring fracture zone of the Questa caldera on its south side. I tried getting a sample. No go. The Red River is north of the road and blocks access to the dikes. Well, crep. The shards around the river banks all looked like granite, except for this one. Under the loupe, this does indeed look like a porphyritic rhyolite, with phenocrysts possibly of quartz or feldspar in a ground mass. But, in a stream bed, it could be anything from anywhere in the watershed, including a quartzite. I drove on a little further. That’s the tailings from the molybdenum mine. 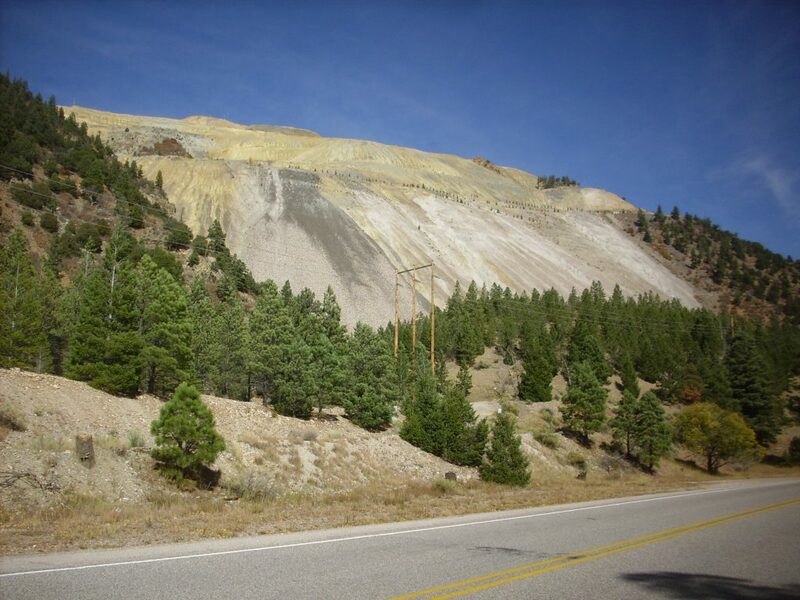 It had produced 4760 tons of molybdenum concentrate by 1984, but shut down permanently in 2014. 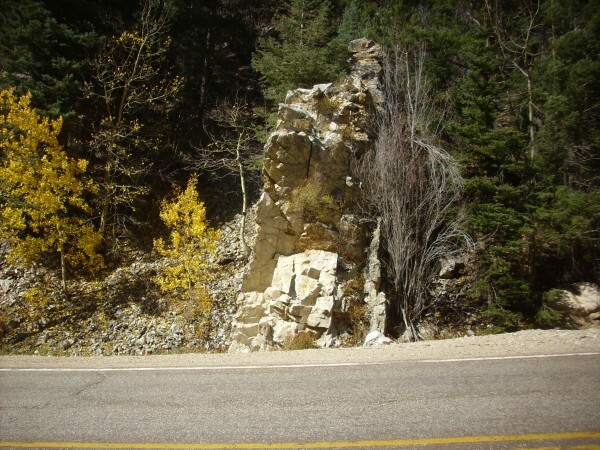 The road log ends with an exposure of the Sulphur Gulch pluton, the chief ore-bearing formation. Then back to Questa and south to see the Rio Hondo pluton. This has a radiometric age of 21-22 million years. The route there give by my road log took me off the main highway onto county roads, through the village of Valdez, and finally back on the highway to the Taos sky area. 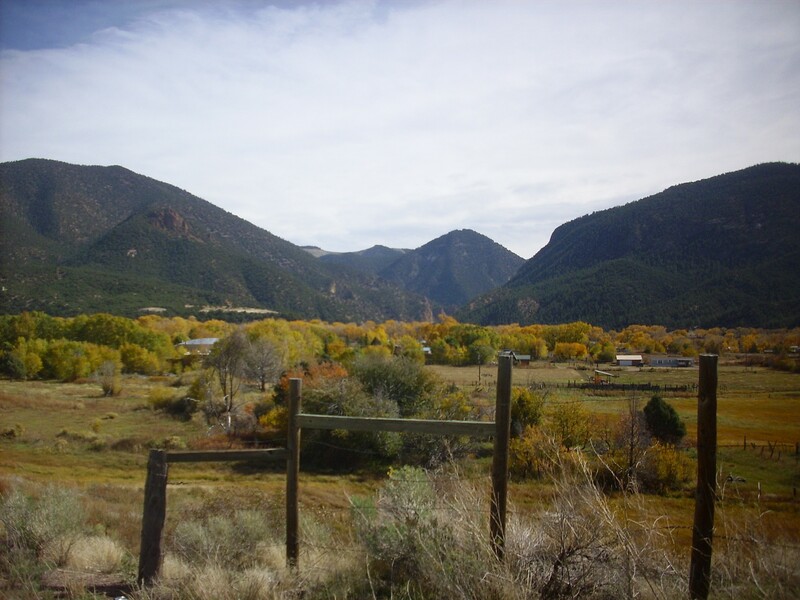 On the other hand, it was a scenic back country drive that avoided going all the way back to Taos. My road log put me at the sheared western margin of the pluton. 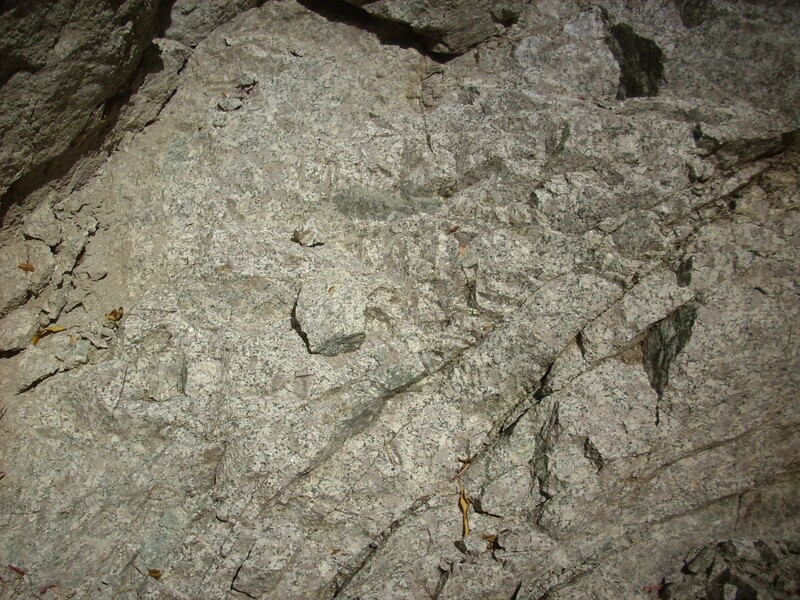 The dark rocks in the middle of the photograph, flanked by unaltered granodiorite on either side, are a shear zone where the rock was severely deformed. At the time of deformation, it’s estimated this zone was 7 to 8 kilometers below the surface. 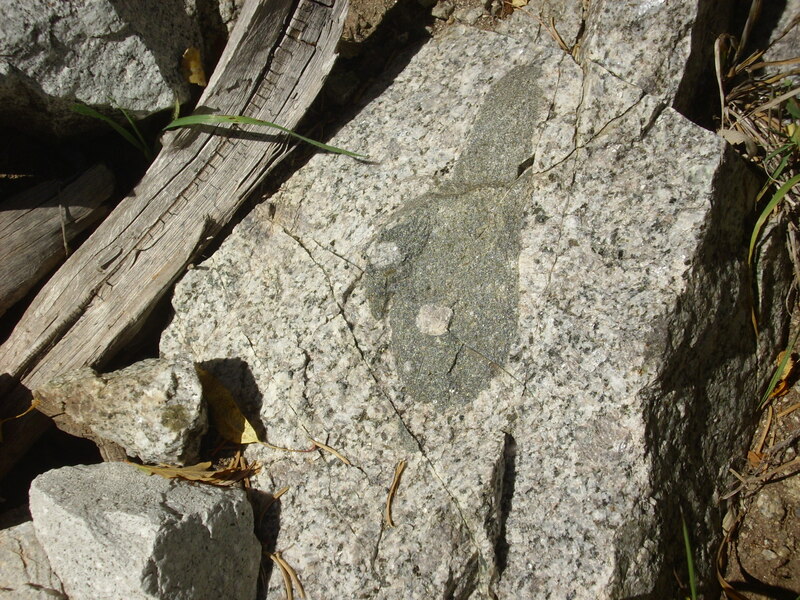 A granodiorite is rich in quartz, like granite, but contains considerably more plagioclase than alkali feldspar. (A true granite has considerably more alkali feldspar than plagioclase.) Granodiorite also tends to have more dark iron minerals than granite, and you can see plentiful dark grains here. Also notice the dark patch above the center of the photograph; this is a mafic inclusion. Further up the road is more granodiorite rich in mafic inclusions. 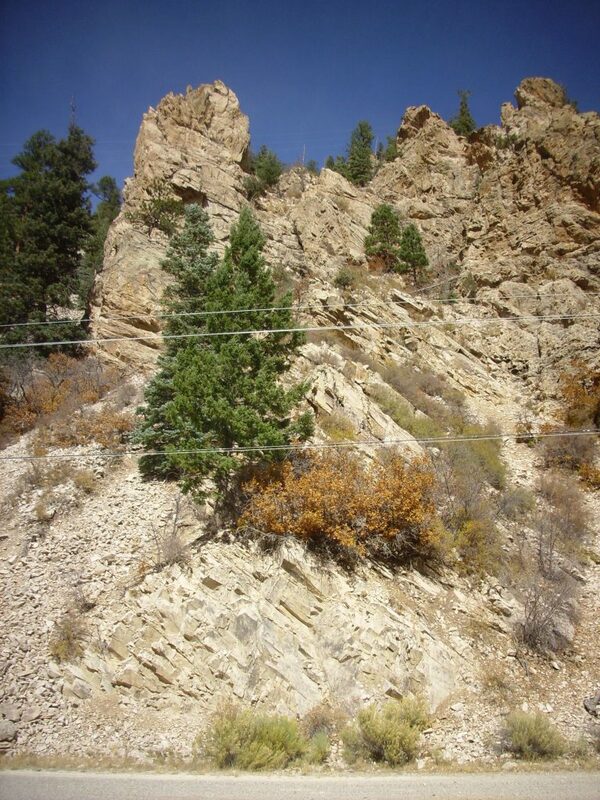 Further up the road is a really spectacular outcrop, with dark amphibolite cut by a series of light rhyolite dikes. 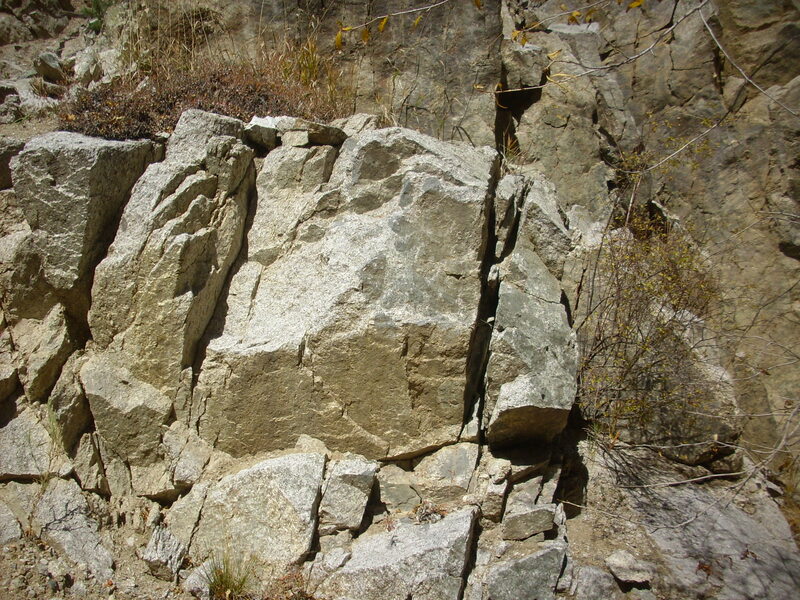 The dark rock is about 1.7 billion years old; the light rhyolite is Tertiary in age, less than 65 million years. Most likely it is around 22 million years, the rough age of the Rio Hondo pluton. The road log ends at another rhyolite dike swarm. There are dozens of dikes in this area, all trending northwest. One is at road level. Here’s a close up, showing both the porphyritic character of the rhyolite (it has large crystals in it) and that it has gotten the attention of a geologist before. Here my road log ended, at least for this leg of the trip. I retraced my steps, mostly, and on the way out I had my Ansel Adams moment for this trip. “Valdez in Autumn”, Kent G. Budge. 2016. Cheap tourist camera at who knows what focus and shutter speed. Don’t y’all come rushing out here to buy a summer home. The place is too gentrified already. Heading north past Questa, I was struck by the landslide scar on the side of this mountain. Turns out that’s intracaldera Amalia Tuff exposed. Further north still, I passed Ute Mountain. Ute Mountain is composed mostly of trachyandesite with an age of 3.8 million years. Trachyandesite is an intermediate-silica volcanic rock rich in alkali metal oxides; it is typical of continental rifting, such as that along the Rio Grande Rift. The San Luis Valley around Alamosa was once a lake, which was only drained about half a million years ago when the Rio Grande cut through the south rim of the lake. I wondered if this might be that south rim on the horizon. I drove through San Luis, which boasts the oldest Catholic church in Colorado, Capilla de Todos Los Santos. And north, towards Blanca Peak and Mount Lindsey. Then through Alamosa, where I stopped for gas. I was somewhat anxious by now to get to Fairfield before dark. For one thing, you can’t photograph geology in the dark. For another, my reservations had check-in by 6:00 PM and, while I could always call and tell them I’d be late, I hated to have to. Well, no; turns out they’re Precambrian-cored mountains, like most in this area. I continued on north, in some haste. But sometimes something is just too good to not stop and photograph. This is Castle Rock. My first impression was that it is another rhyolite dike swarm, but it turns out this is an outcropping of the Wall Mountain Tuff. 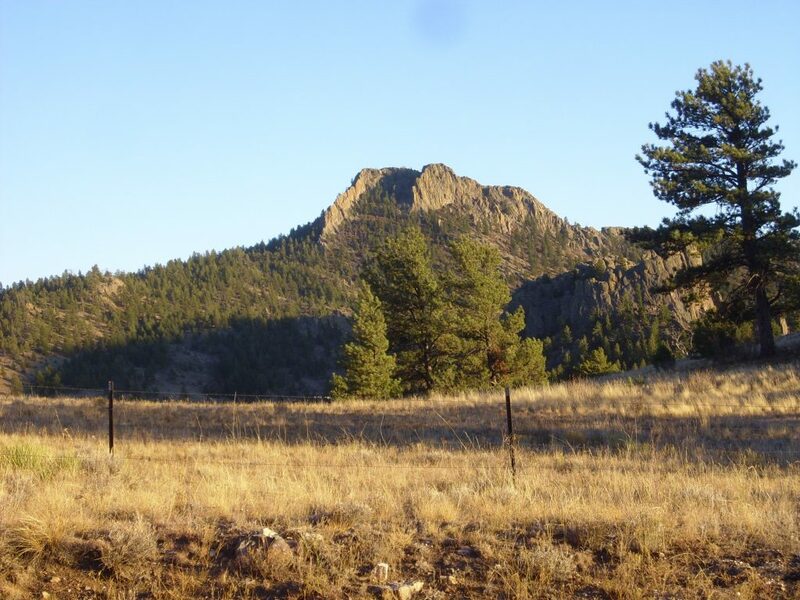 The Wall Mountain Tuff has a radiometric age of just over 36 million years, and it is though to be the outflow sheet of a truly massive eruption from the Mt. Aetna caldera. We’ll see more of Mt. Aetna later. The outflow sheet is mostly eroded away now, but its remnants cover an area considerably greater than that of the Bandelier Tuff in the Jemez. A truly massive eruption. About this time I called my hotel to ensure that I would still have a room when I got there. 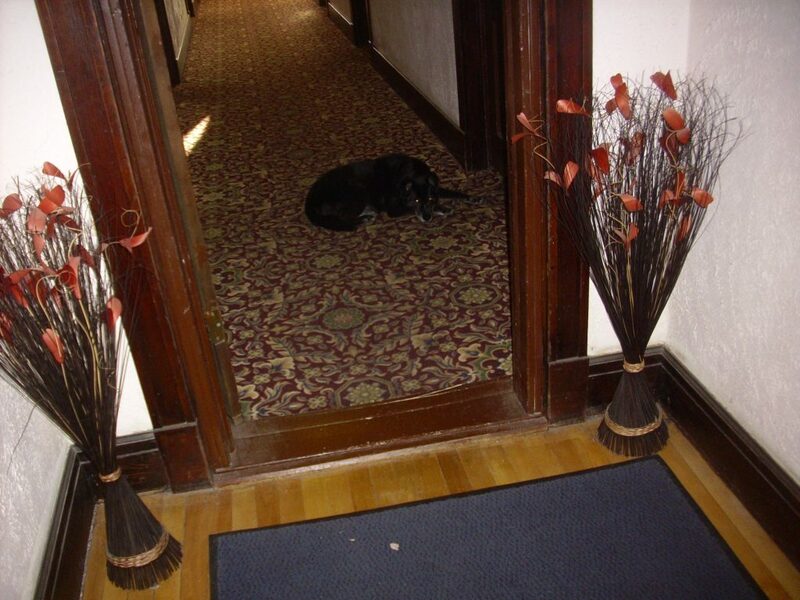 The hotel manager, who it turned out was also the front desk manager, custodian, chambermaid, and keeper of hounds, told me laconically that my friend (Bruce Rabe) was hanging out in the lobby and there was a room ready for me across from his. Well then. 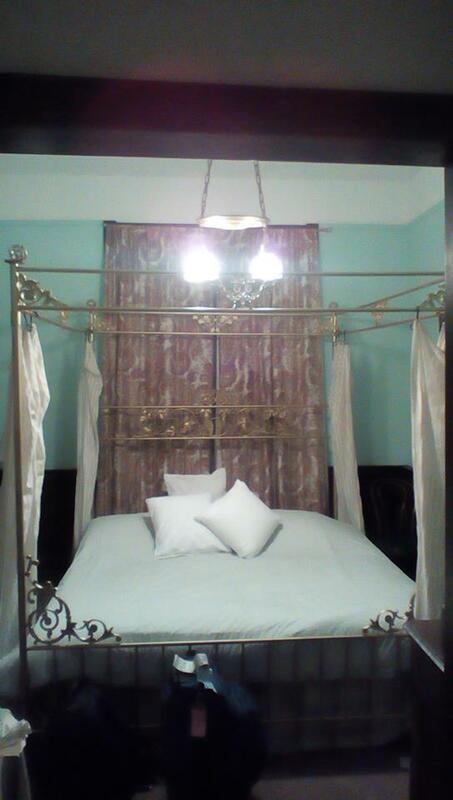 Bruce was bemused to find that he had apparently been assigned the honeymoon suite. He commented that all that was missing was a lush courtesan. However, the only female I saw the entire time we were at the hotel was the older dog. Which, come to think of it, would not be a bad sleeping companion. I highly recommend the hotel if you’re ever in Fairplay. But then, I have quirky tastes. Bruce and I exchanged books (mostly in my direction), we considered some plans for the next day, and then we ate at the one non-saloon restaurant in town, an “Asian fusion” offering Chinese, Thai, Vietnamese, and Japanese dishes. The hot and sour soup was actually pretty good, though the taste of sesame oil remained with me for the rest of the trip; the kung pao chicken was good, too. It turned out the place had a bar, after all. 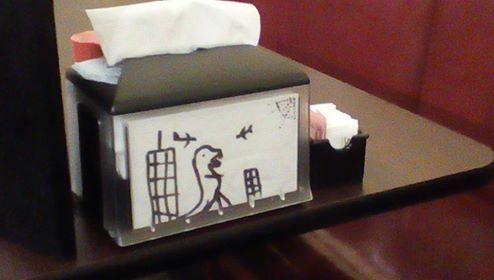 And our napkin stand featured some interesting art. You have a friend in cheeses. I ate half the ice cream, decided to save the rest for later in Bruce’s thermos box, and we turned in.